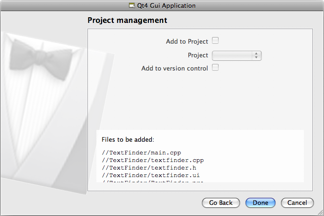 In this example, we select a Qt4 Gui Application and click on OK.
Next, we set the project's name and its path. Click on the Choose... button to browse and select your path. Ideally, the path should not contain spaces or special characters. 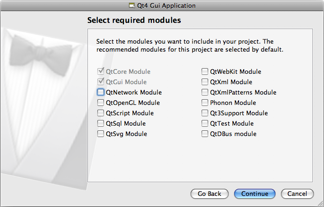 Check the check box for each Qt module you want to include into your project. 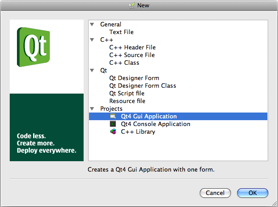 Since we started a Qt4 Gui Application, the QtCore and QtGui modules are set by default, but you are free to add more. Specify the name of the class you want to create. 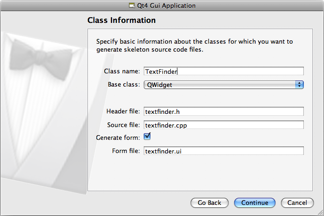 The Header file, Source file and Form file fields update automatically according to the class name you choose. 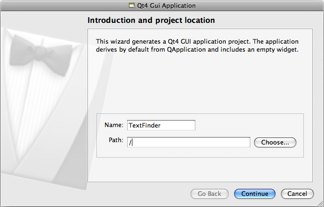 Remember to select the base class for your class, either a QWidget, QDialog or QMainWindow, from the drop-down list. Finally, review the files that will be created for you. To generate your project, click on Done.